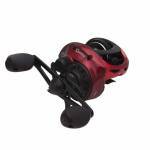 Zebco Quantum Catalyst 10BB 7.0:1 Right Hand Baitcast Reel. Features a centrifugal braking system, l..
Zebco Quantum Code 8BB 7.0:1 Baitcast Reel - Free Shipping. Features ACS II cast control and eight b..
A 8 bearing system with a zero friction pinion design. Lightweight graphite body and side covers. Al..